The Vue Hotel brand exemplifies the new wave of locally rooted boutique hospitality experiences, a global cultural phenomenon now finding roots in China. ’Vue” in French means ‘view’ or ‘a way to see’; and Vue hotels aspire to present a fresh way of ‘seeing’ hospitality design and experiences. Vue’s DNA upends conventional Chinese notions of hospitality and is defined by four core pillars: 1. Encourages Socialising, 2. Transcendence of culture, 3. Delightful & Whimsical 4. Relaxed & Inviting. Each bespoke Vue property will draw richly from the culture and heritage of its neighbourhood, but always transcending it with a contemporary and whimsical twist. Unapologetically modern in its approach, the brand embodies the desires of the urbane traveller; creating comfortable and inviting social spaces that are paired with intriguing art and innovative cuisine. 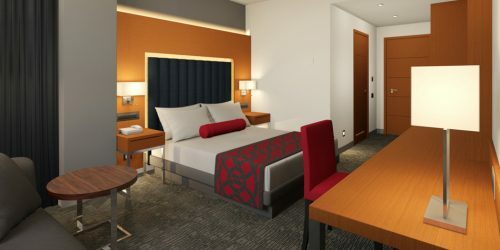 With expansion plans for multiple properties in key cities across China, the Vue Hotel brand is pioneered by the Orange Hotels Group and created by internationally acclaimed design studio Ministry of Design, who are responsible for the holistic strategy, branding and all design and art creation. Vue Hotel’s first flagship property is located in Beijing, in the Hutong district of Houhai. The hotel compound sits on the edge of the picturesque Houhai lake, and neighbours a verdant public park, as well as historic Hutong houses which are still used by local inhabitants today. Located along Houhai’s banks are also a district of bars and vibrant cafes. For Vue Houhai Beijing, the narrative drew inspiration from the lake and its animal inhabitants. In our imaginings, the presence of Vue in the Houhai neighbourhood has a magical and whimsical transformative effect on the animal inhabitants. These friendly animals (foxes, rabbits, deer) are transformed anthropomorphically from mere animals to become more humanlike, in the same way animals in cartoons often adopt human personas. These art installations are dotted throughout the compound and are also found in each room. Other art installations, which parallel this narrative but focus more keenly on the theme of the “transcendence of Chinese culture” can be found in other public spaces such as lift lobbies and corridors. The hotel compound comprises a series of buildings with a variety of architectural styles and approaches. Although designed primarily in the Chinese vernacular, the different buildings span a range of ornamentation from highly decorative roof eaves, characterful gargoyles, sculptured balconies and latticed window frames, to pared-back jack roofs and plain brick work wall finishes. The design approach has been to unify this diverse collection through colour and landscaping. All the buildings are conceptually draped over with a dark charcoal grey coat of paint, upon which key architectural details have been highlighted in a contemporary gold patina. These featured elements shimmer against the dark backdrop and their prominence suggests an informal ‘cataloguing’ of key architectural details. As guests explore the compound, this ‘catalogue’ of details gradually brings into focus the distinction between the historical versus the contemporary: a subtle that highlights the rich tension arising from any adaptive reuse design. Conceptually, the design harnesses all the ‘left-over’ spaces in-between each building, to tie the compound into a single holistic experience. These in-between spaces are treated graphically with an ‘ice-ray’ lattice pattern inspired by traditional Chinese screens. Treated three-dimensionally, hardscaped floors and passageways rise to become private balconies or garden enclosures. Upon arrival and en-route to the Reception, the guest experience first begins at one of Vue Hotel’s social hubs: the FAB café and bakery. This casual and vibrant venue fronts the buzzy Hutong main road where scenes of daily local life and culture can be witnessed. With both terrace alfresco as well as indoor seating, FAB is the perfect place for breakfast, a quick snack or a rousing cup of coffee. The interior design approach draws from characteristics of the street front in its use of materials and colour accents. A wide range of seating nooks and furniture allows the FAB experience to feel varied and engaging. The Reception is the first experience exclusive to overnight guests. Intimate and personal, the check-in experience is casual but comfortable. Guests pass a concierge point where the property’s first feature installation artwork is placed and into the Reception, where the property’s signature colour scheme and dramatic spatial design themes are manifested. Housed at the Lakeside-edge of the hotel compound in a former warehouse building, Vue Hotel’s signature restaurant and rooftop bar offers an extensive tapas sharing menu and cocktails/liquor selection. Upon approaching the Pink Rabbit from the adjacent courtyard, guests encounter a whimsical installation atop the building’s roof of two gigantic wireframe rabbits. The Pink Rabbit’s casual but sophisticated atmosphere plays itself outin the interior design – with exposed metal and wood trusses, an open display kitchen, lounge style seating paired with an feature bar and deejay counter contribute to the overall upbeat vibe. A series of private dining rooms and quiet garden dining zone provide opportunities for exclusive entertaining, whilst the rooftop bar and Jacuzzi pool offer a treetop alfresco experience, with full views to the picturesque Houhai lake and park. 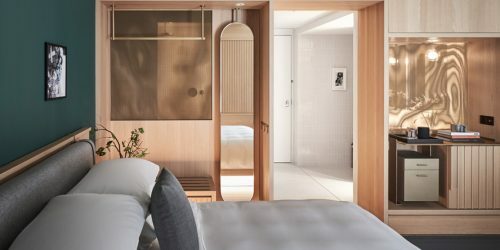 When conceptualizing the essence of its hotel rooms, the brand decided to celebrate innovative spatial design but pair it with a level of creature comforts that would rival the best design hotels in the market. High on the agenda was also a desire to balance an unapologetically contemporary design approach with locally inspired culture and imagery. The resulting rooms are whimsically surprising but yet familiar. Spaces are unexpectedly divided by the use of colours, tones and materials, whilst installation art in every room continue the hotel’s overarching narrative. Dramatic bath spaces complement restful sleeping spaces. Beyond the standard rooms, suites and garden rooms extend the guest experience with generous living and dining spaces, oversize bathrooms and alfresco lounge areas. Each Vue property is designed around a central narrative inspired by its locale or culture. Undertaken as a major adaptive-reuse exercise, the hotel comprises a series of artistically transformed quasihistoric buildings from the 1950’s. This intriguing hotel compound invites you to explore its many facets where you will discover a series of landscaped gardens, a bakery café fronting the bustle of the Hutong streets, a signature restaurant in a warehouse, a rooftop bar overlooking the lake, a gym and over 80 rooms and suites, several with private gardens or with views overlooking the park or lake.